Publisher’s summary: In the court of King Henry VIII, nothing is free-- and love comes at the highest price of all. 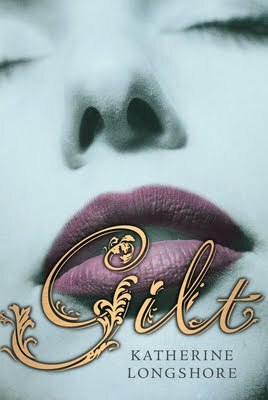 My take: As you can obviously see from what I normally read, I’m pretty much not one who’d ever be caught reading a historical fiction, but I absolutely loved Gilt! I’m actually not a fan of history…period…end of story. But Gilt made learning about some history that I didn’t really know much about a lot of fun! I love that Katherine Longshore wrote this book specifically for the Young Adult crowd. I wasn’t able to find Catherine Howards’ (Cat’s) true age when she actually married Henry VIII in real life, but she had to be really young, and Katherine Longshore did really well to capture the mannerisms of teen girls in that time era. Katherine also did a fabulous job creating a very entertaining story while still following authentic history! As for the characters, Cat (Catherine Howard) was such a spoiled brat that I waited and hoped throughout the whole story that she eventually would be humbled. There were times throughout the book that I couldn’t believe Cat actually just did that…and then in the very next scene she topped herself and I couldn’t believe that she then actually just did THAT! I will let you read the book for yourself to find out if she is ever humbled at any point from the start of Gilt up until her beheading. FYI… I hope that’s not a spoiler because, in real life, King Henry VIII actually beheaded Katherine Howard! Kitty was a fun character. There were times when I wished she wasn’t so loyal to Cat, but Kitty’s loyalty never wavered. She is that naive friend that you feel like you just have to help toughen up. And I fell hard for William, but I really wish I knew where he and Kitty’s story eventually led. Lastly, I cannot stand Henry VIII!!! And, even if Cat weren’t such a “B,” I can totally understand why any woman would be disloyal to him…even with the fear of getting an axe to the back of the neck hanging over her head (pun intended)…or getting disemboweled. He was a truly disgusting old man. I hate to say it, but I really liked the way the story ended. And, even though it made me want just a little bit more, I was still satisfied with that ending. I read this book by listening to Audible and I’m thrilled! This is the perfect book to listen to in audio and the reader’s voice and style fit the story perfectly. I think I'm going to have to listen to this one for sure! You have gotten my interest peaked with it! I really liked getting to know about Catherine Howard through this book as I was always more interested in Anne Boleyn. Great exposure to the time period. Who was the narrator? I actually *love* history so this sounds very interesting to me. I actually love reading about history, but this book was a little slow-paced for me. It did have believable characters though. I really enjoyed this book too and can't wait for Tarnish to come out this summer!